Easy to Use - built from the ground up, Permute is a perfect example of what a Mac app should be. With a gorgeous interface and drag & drop simplicity no need for complicated options. Insanely Fast - Permute was engineered to be incredibly fast. Let us take care of the hard stuff. 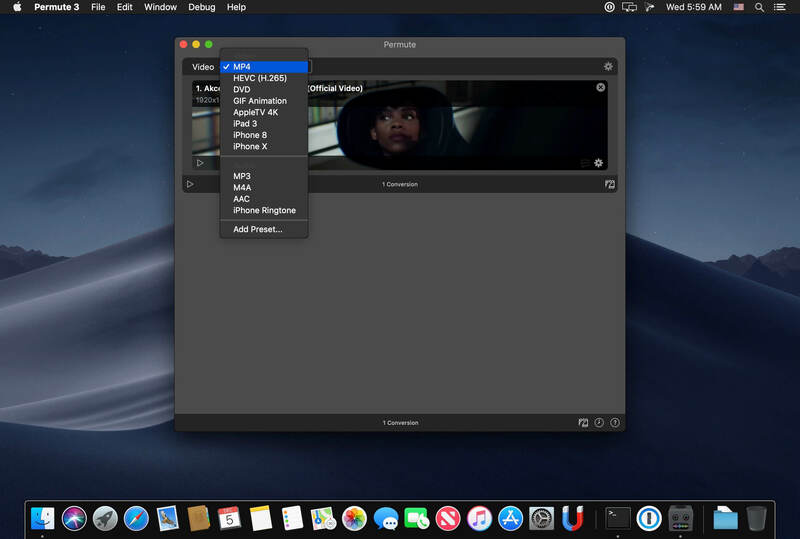 Just select the video format you want and it’ll be done faster than you can say “hardware acceleration” - MP4 and HEVC presets now take advantage of your machine's hardware acceleration capabitlities, speeding up HEVC conversions more than 3 times over previous versions of Permute! PDF Support - Permute 3 now includes support for stitching multiple images into a single PDF. Everything Included - It doesn’t matter if you’re converting home movies or processing images. Permute can do it all. We support nearly every format and have plenty of device presets to choose from. Looks Amazing - Whether you use dark mode or not, Permute will look amazing. Taking advantage of the modern technologies, Permute will even change its icon in dark mode. Keep the Schedule - Video re-encoding is quite demanding on computer resources. This is why you can now schedule Permute to convert videos e.g. at night when you're not using your computer. And so much more! - There are so many other great features in Permute - adjust volume of an audio file or an audio track in a video. Batch-resize, rotate and flip images and videos. And more! Completely Rewritten – Permute 3 was started from scratch - completely new project, everything written from the ground up again. UI Redesign – the UI has been redesigned from the ground up. It’s faster, more fluent and visually pleasing. 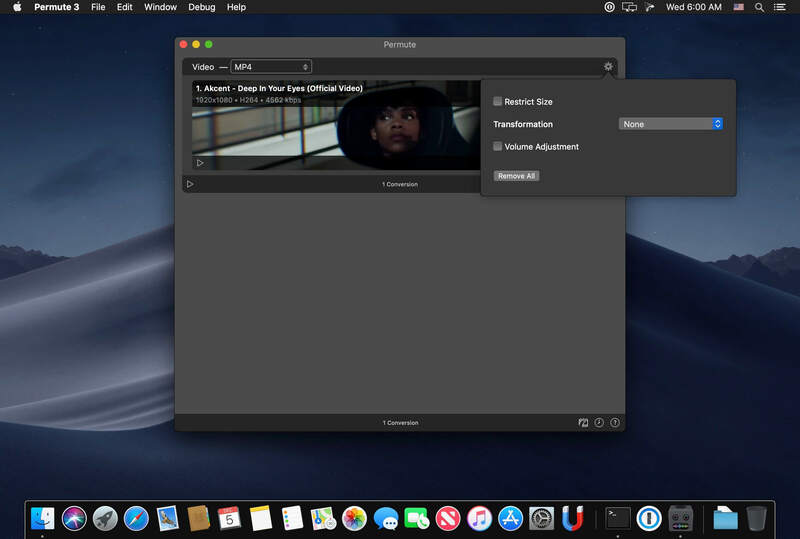 Dark Mode – Permute now works 100% with the dark mode, even adjusting its Dock icon based on your macOS theme. Image Stitching – Stitch images together into a PDF. HEVC (H.265) Hardware Acceleration – HEVC (H.265) video encoding now supports hardware acceleration, resulting in conversions more than twice as fast. Scheduled Conversions - Schedule delayed conversion start. Groups – Put files into groups and set different settings for different groups. Customizations – Customize settings on a per-group basis without modifying the preset. Multiple Subtitles – Add or copy multiple subtitle tracks from the source file. ... and many, many other minor fixes and improvements. Not working in Mojave. Same as Version 3.0.0. Uhh, that was my fault. SIP is/was always disabled. But unfortunately, i had to reinstall macOS / update my existing Installation via USB-Installer. This update is telling me that it cannot be opened because of a problem. I have already enabled Gatekeeper. Also, what's the command to undo Gatekeeper in Terminal? Since I enabled it, more apps are giving me the same warning upon launching.